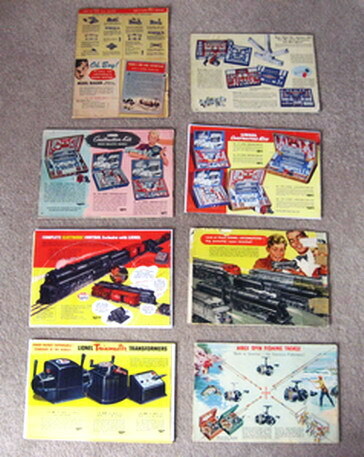 1946-1953 Lionel Consumer Catalogs (Seconds) Good to Very Good Condition. - $125.00 : Olson Hobbies, Welcome To The Train Page! 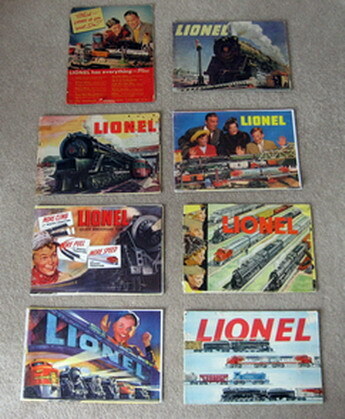 One set of eight Lionel catalogs starting with 1946, thru 1953. These are not in A-1 condition, so should be used more for a reference set, rather than a collection set. 1946 consumer no outer cover version, newspaper print, missing staples, good condition, small tears on some pages, total of 16 pages. 1947 consumer, front cover with slight fold in center, pages worn. Good condition, 32 pages. 1948 consumer, with dealer rubber stamp on front cover with 2" tear, taped and repaired, 36 pages, good condition. 1949 consumer with original covers with replacement pages 3-6, stapled to binding, graded good. Front page cover cut short 1/2". 40 pages. 1950 consumer with replacement back cover. Very good condition. 44 pages. 1951 Consumer, with 2 binding holes in catalog, back cover with upper small portion missing on back page. Very Good Condition, Dealer Rubber Stamp front and back covers. 36 pages. 1952 consumer with replacement front and back covers. Pages 16-20 and 33-36 are also replacement pages. Binding taped. Good condition. 36 pages. 1953 consumer, binding taped, page 28 taped, writing on cover. FAIR condition. 40 pages. For further information on the catalog contents, see the individual year listings. Due to the CONDITION of these, they are being sold AS IS, non returnable. If you are expecting to get something top rate from these, you probably won't find them in this set. Normal price, if purchased individually, would be $215.00. Your price: $125.00. DUE TO EXCESS WEIGHT OF 8 CATALOGS SHIPPING WILL BE MORE EXPENSIVE.